Abrasive discs are used by dental technicians to sculpt and polish dentures. The discs are spun on the technician’s motorised hand piece at speeds of up to 20000 rpm. The abrasive surface applies sculpting and polishing friction, so high torque loads are normal. 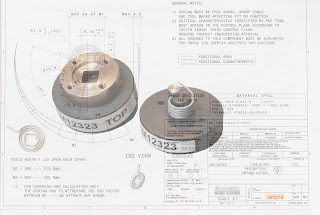 In order to reduce the possibility of the disc’s two parts – centre ring and abrasive disc – separating during use, the manufacturer wanted to test the torque performance of the join between them. 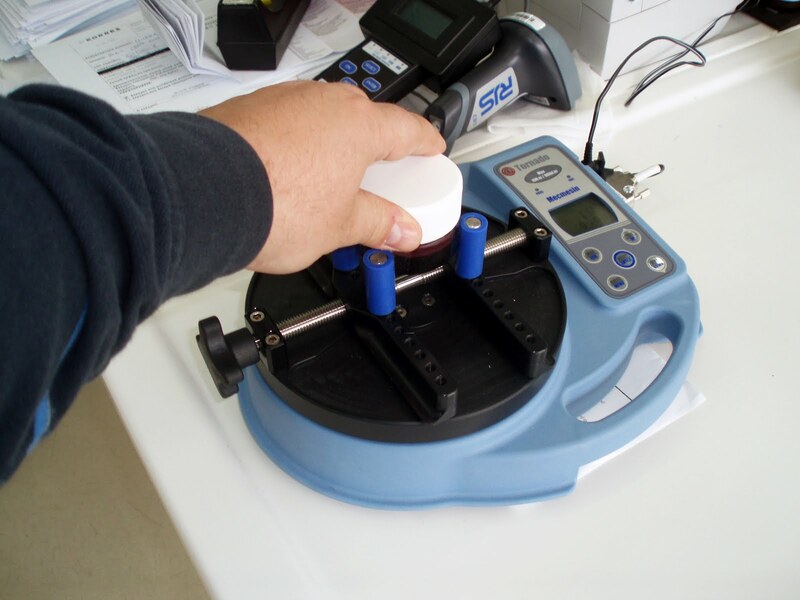 The specially made adaptor/jig fits directly over the rotating drive shaft of the Vortex-i torque tester to hold the sample securely and centrally, so that drive-shaft and centre ring are exactly aligned. Once the disc is placed in the recessed holding plate (reversible to accommodate the two sizes that the disc comes in), the clamp plate is screwed down over it. 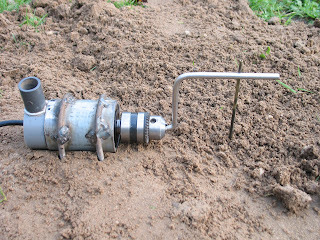 A probe, which is connected to the torque-sensing transducer, is lowered till its point penetrates the centre ring and can travel no further. 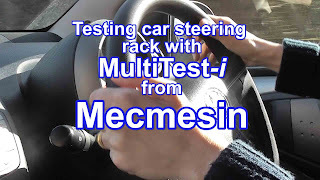 This video introduces the adaptor and shows the test being set up. The test is designed to test to destruction the join between the centre ring and the abrasive disc. Pressure from the clamp plate ensures the abrasive disc does not spin inside the jig but rotates in unison with the jig. The jig is rotated to 90 degrees clockwise and then 180 degrees anti-clockwise. If the centre ring and abrasive disk remain aligned (the radial marking will indicate this), the join between them is good and the disc passes the test. If the quality of join between centre ring and disk is insufficient, the centre ring will rotate independently of the disc and the sample will fail. In this picture, the post-test misalignment of the markings on the disc indicate that the outer abrasive disk has slipped around the centre ring, so this sample has failed. The torque data is exported via the Vortex-i’s RS232 port to the PC for monitoring, analysis, and storage. A typical car dashboard features several rotary selectors. Temperature, vents, blowers, and headlights are operated by rotating dial-type switches. Automotive manufacturers test these components to determine whether the torque required to operate them is within acceptable limits. A selector can be neither too stiff nor too slack. If too stiff, the driver will struggle to operate it efficiently and safely; if too slack, selection will be uncertain and slippage could result. Rotary selectors must also provide definite tactile feedback, to provide indication of the selector's position when visual contact is a problem, such as when the vehicle is in motion and the driver cannot be distracted. Working from carefully derived ergonomics parameters, manufacturers define torque ranges for their selectors. Samples of the finished component will undergo testing as part of the quality control process. 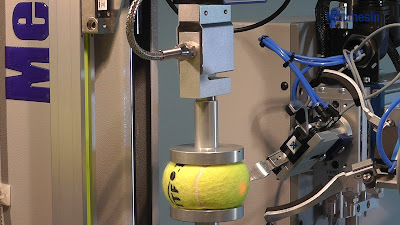 The test will obtain measurement of the torque required to rotate the selector, so the test device must emulate the human motions involved and capture an accurate picture of the selector's torque performance. 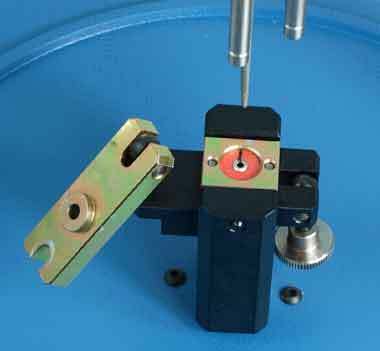 In this photo, a rotary selector (temperature dial) is undergoing torque testing on a Vortex torque tester. The long pegs grip the switch’s housing securely to the lower platen, so that unwanted movement does not influence the torque reading. 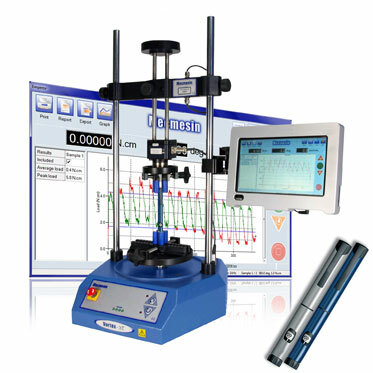 Accurate torque measurement is possible only if the switch's axis, the tester's drive shaft, and the transducer are in direct alignment. While the alignment of transducer and drive shaft are engineered into the design of the Vortex and are unchangeable, the switch's axis is potentially variable, especially if the switch's surrounding housing is irregular in form. The housing must be held level and stable throughout the test. The holding mechanism could be component-specific or adjustable. An adjustable mechanism, such as that shown here, is a more economical solution for manufacturers who have a range of components and require short setup times and easy, simple reconfiguration of the test device. The Vortex's adjustable pegs and mounting table allow components of various shapes to be held level and central so that correct axial alignment can be achieved. The switch's selector bar is gripped by the upper set of pegs. These upper pegs (also adjustable for neat, secure gripping of the selector bar) are fixed to a static platen and hold the selector immobile while the component housing is revolved by the lower platen. Together, these platens, via their fixtures, apply to the rotary selector the pinching and twisting motions performed by the human user. 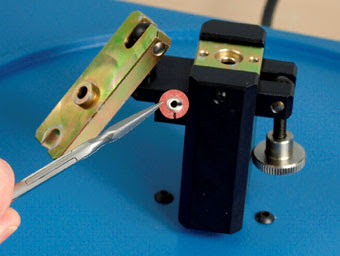 The upper, static platen is connected to the torque-sensing transducer. The transducer reads the torque experienced by the switch during the test and sends this to a display or computer, where it is reported in graph form for analysis and stored. Insulin pens are used by diabetics to self-administer insulin shots. 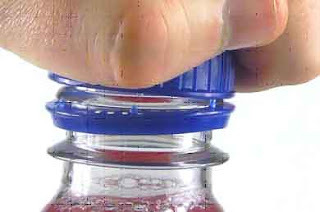 The user turns the cap section of the “pen” to select an insulin dosage. The pen manufacturer needs to know that the torque required to turn the cap does not exceed the ability of an ordinary user. Dosage-identifying numbers are printed around the circumference of the cap, so selection is by rotation of the cap till the required number is aligned with the raised pointer on the body section of the pen. This rotation requires reasonable effort on the part of the user and distinct clicks provide resistance and response. The notches allow the user to select a dosage if they are experiencing vision problems or are administering in poorly lit environments. Rotating the cap through the notches requires torque. The pen manufacturer specifies an acceptable range of torque and will conduct periodic torque testing to determine quality and uniformity of product. Insufficient torque would cause the selector to slip around too easily, complicating selection; excess torque would prevent less dexterous or weaker people selecting their insulin dosage with ease. Testing insulin pen rotation torque requires a sophisticated torque tester. 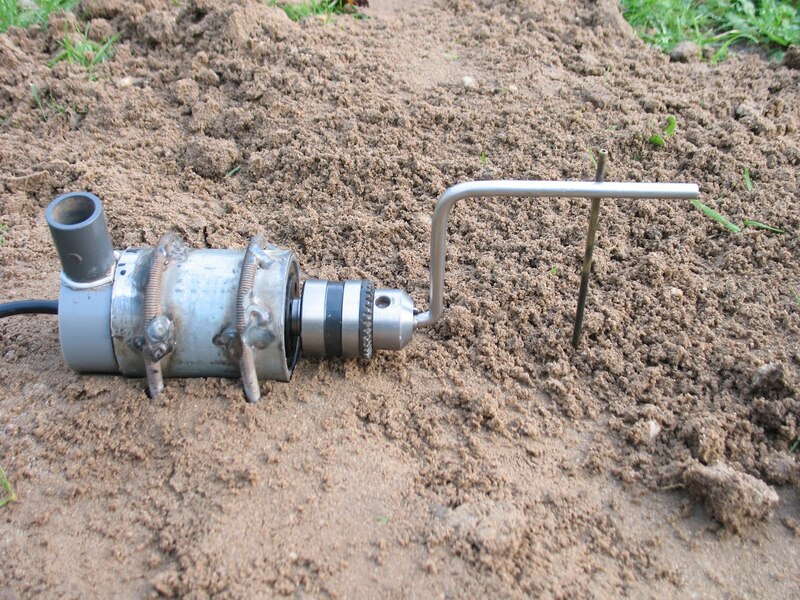 Mecmesin’s Vortex-xt (pictured) is such a device. The Vortex-xt holds the pen, gripping it between pegs at the pen’s base and cap. 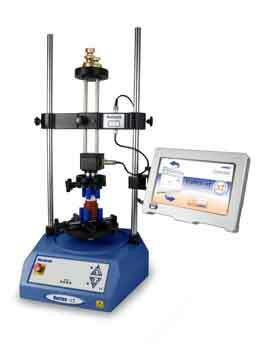 The Vortex-xt’s base rotates while the cap is held static under the torque transducer. 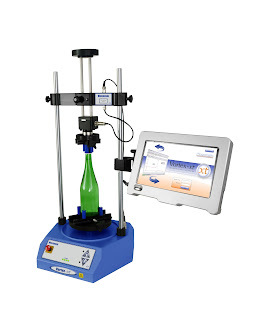 This action simulates the user’s rotation of the cap and the resultant torque produces a stream of data that is reported in graph form on the touch screen display connected to the frame of the tester. The graph will identify the pen’s torque performance through one full rotation, revealing uniformity or discrepancy of torque between notches. Graphing occurs in real time, and data from multiple tests can be stored for later analysis. Childproof closures are a standard safety feature of pharmaceutical containers. Their effectiveness is a critical quality concern for manufacturers of pharmaceutical packaging. These closures (caps) require accurate torque testing. They have to preserve the contents while protecting children from them, and provide accessibility to older but possibly frail persons. The Vortex-xt torque tester features a weights tray that is connected by rods to the torque transducer. When loaded, the tray provides the pushdown (top-load) force necessary for simulating the manual compressive force that users apply when opening childproof caps. 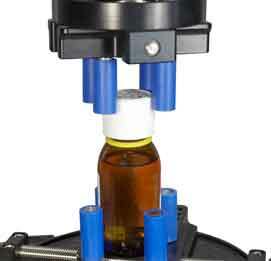 The platen rotates the container to simulate the user’s twisting of the cap (torque). The Vortex-xt’s components are a torque-sensing transducer and a motor-driven platen that provides rotational motion at a specifiable speed (1-20 rpm) to a specifiable angle, time, or force (e.g. rotate to 180 degrees; rotate for N seconds or minutes; or stop at 5.5 Nm). Test results can be displayed on the touch screen (interface) attached to the stand (Vortex-xt) or exported via the RS232 port to Mecmesin’s Emperor software running on a computer. Graphing, analysis, and storage of test data are possible on either configuration. How is a Mecmesin torque tester helping an international optics company deliver vision to sight-challenged people in poor countries? Adlens is a maker of adjustable lenses with an Innovation Centre in Oxford, UK. Their liquid- filled lenses allow the wearer to self-adjust the magnification of their spectacles manually. The lenses are adjusted by thumb-and-finger rotatable dials on the frame and are detachable once the correct magnification has been selected. This highly practical, low-cost optical technology provides profound benefits to vision-impaired people in less developed countries where optical services are inaccessible to many. 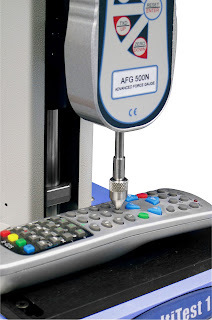 Adlens, the innovative company behind the adjustable lens technology, use a Mecmesin Vortex-i torque tester to ascertain that the rotating components of the lenses are reliable and ergonomically acceptable. Discover how a famous food manufacturer uses a Mecmesin peel testing device to reduce wastage resulting from seal adhesive defects and provide their customers with a safe, well sealed edible product at minimum cost. 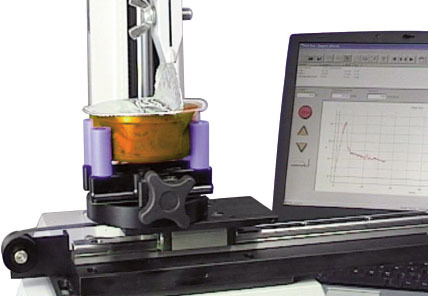 Efficient, economic peel testing of the seals of their microwavable pots reveal the force required for peeling and identify inconsistencies in the adhesive layering between seal and pot. Using their Mecmesin peel test solution, they are able to observe materials performance and adhesive layer performance in detail, store multiple tests, and overlay results for comparison purposes. 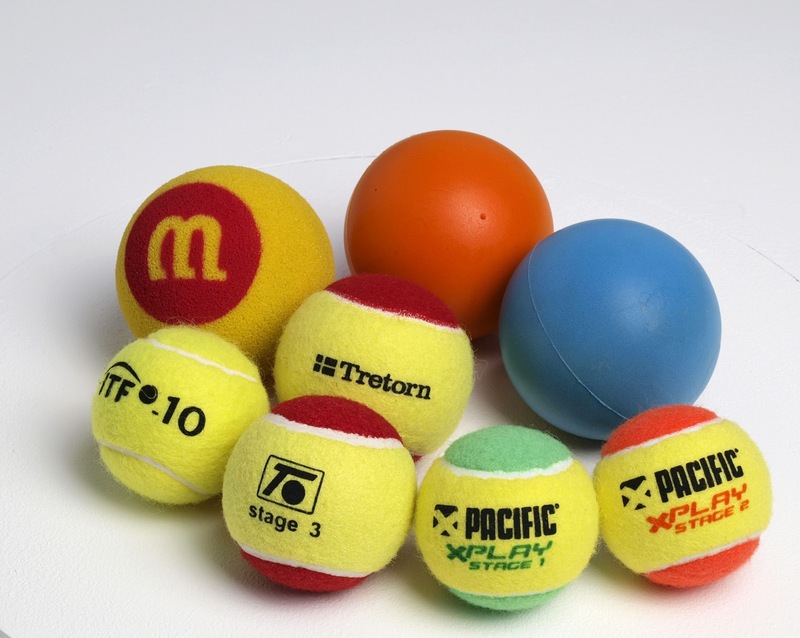 The results are cost savings through elimination of excess adhesion, reduced wastage, and greater batch consistency, which translate to fewer returns, fewer customer complaints, and contribute to a successful, popular product. Full story here. Why does one of Portugal’s oldest and most famous mineral water companies use a Mecmesin digital torque tester? 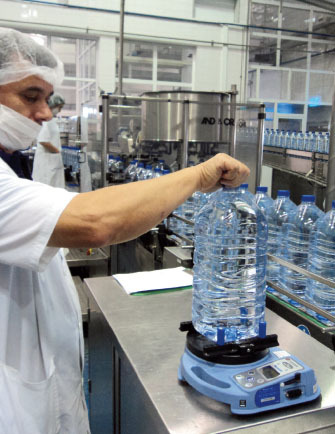 At the Água Luso bottling plant in Luso, Portugal, bottles are routinely tested for correct closure torque. Capping machines must cap bottles at a torque that provides a quality-assuring, leak-preventing seal but allows persons of ordinary strength access to the bottle’s contents. No bottler wants leakers: product is lost, transportation and storage become messy, and retailers will complain. Worse still, a degraded product could become a health hazard to the consumer, with ramifications for company image and sales. 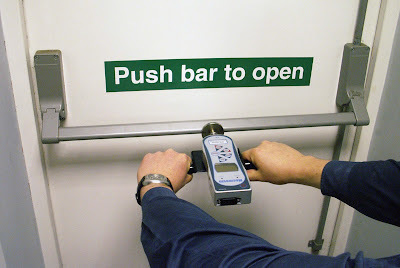 A quick, easily performable torque test provides an effective solution. 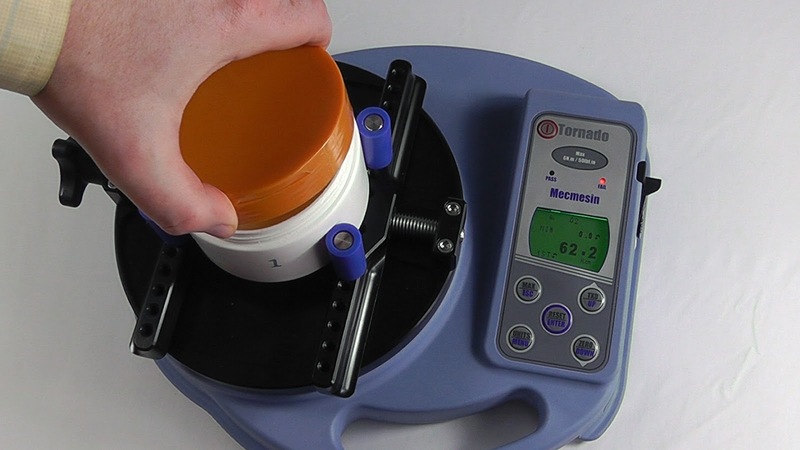 Mecmesin's Tornado digital torque tester is a compact, portable, extremely usable device that offers packaging manufacturers line-side pass/fail and tamper-evident (slip and bridge torque) testing capability. Get the details here. A famous Scottish whisky maker uses a specially designed, dual-function Mecmesin tester to measure the forces required to remove and reinsert a whisky bottle stopper. 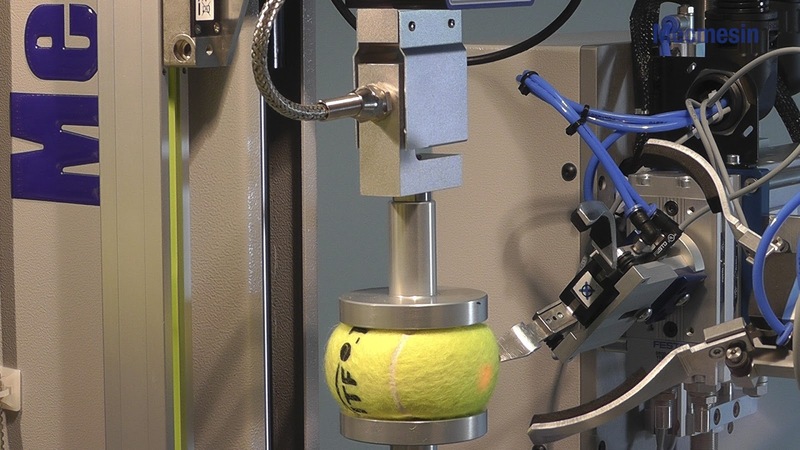 The Mecmesin device has been specifically configured to provide a combination of simultaneous pull/push and twist (compression/tensile and torque) forces to emulate the natural human movements involved in stopper removal and insertion. 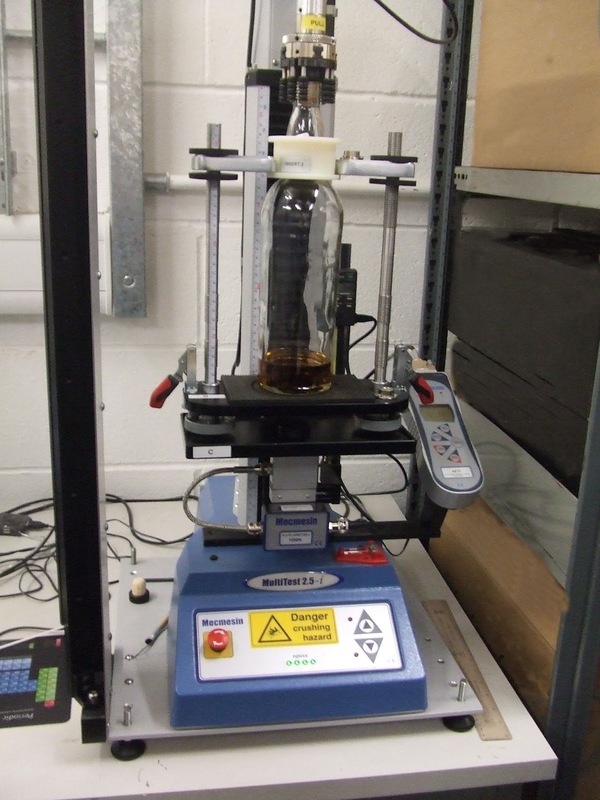 Testing stopper torque and force reassures the whisky maker that their product is unlikely to be compromised by inferior packaging. 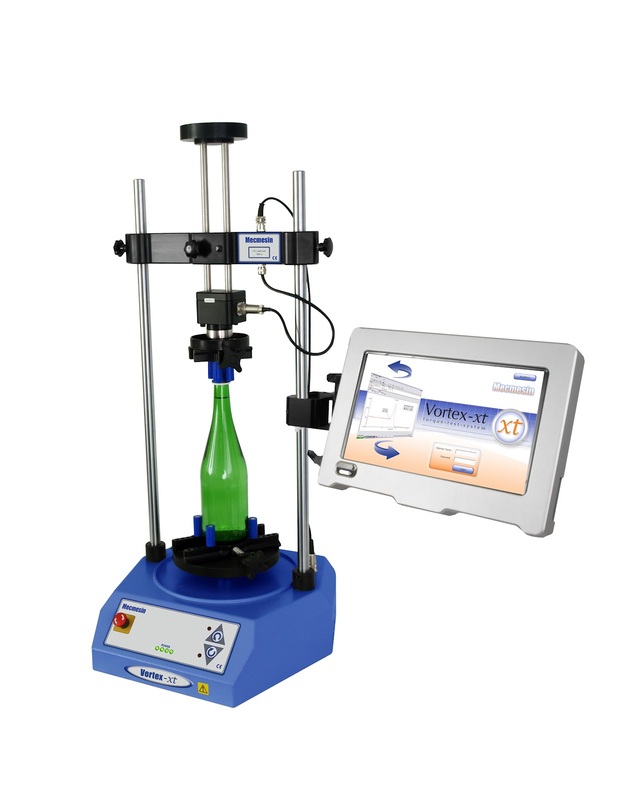 The test ensures that separation of the bar top and cork portion of the stopper does not occur, and that the cork portion will tolerate the torque and compressive/ tensile stresses it will experience during extraction and insertion. Data from the two tests, which occur concurrently, is exported to a PC, on which graphing and deep analysis can be performed. Failure to test for stopper quality would likely result in broken stoppers that spill cork chips into the whisky, spoiling the product and damaging the company’s prestige. Since the company’s best selling lines include $1000 bottles of whisky, they rightfully take quality-assurance very seriously, and have chosen a custom-adapted MultiTest 2.5-i to assist them. Find the full story here.